A college student shadows Dr. Mell Duggan, right, to learn about laser technology. The transurethral resection of prostate (TURP) is the current gold standard for treating benign prostatic hyperplasia (BPH), but the less invasive prostate laser vaporization technology is proving to be beneficial for patients as well and has similar outcomes to the traditional procedures. The green light procedure typically is performed on an outpatient basis under general anesthesia and removes excess prostate tissue using a patented high-power, narrow-spectrum laser. The laser energy vaporizes and precisely removes the enlarged prostate tissue in a usually bloodless procedure, allowing the patient to remain on blood thinning medication. The laser also makes it easier to treat very large prostate glands which typically require an open surgical procedure. Objective measures such as flow rate and patient satisfaction rates are equal to the results of TURP and can be done on some patients who are not candidates for TURP, Duggan says. Following a TURP, the patient spends one to two days in the hospital with a large catheter and constant bladder irrigation. The TURP can result in the absorption of irrigation fluids during surgery which can be a significant problem in patients with congestive heart failure. As a result, many elderly men may not be good candidates for the surgery but may tolerate the laser vaporization, because absorption of irrigation fluids during the laser procedure has not been significant. Another reason a lot of physicians aren’t performing the procedure is because they are not being trained on the laser vaporization technology during their residency. “The Board of Urology requires residents to perform a certain number of TURPs, so there aren’t a lot of cases left over for performing the laser procedure. As a result, they have to learn the procedure after their residence which is often difficult to do,” Duggan says. 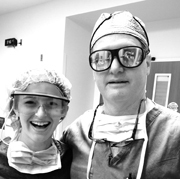 Duggan has taught the Greenlight PVP™ procedure to physicians in Alabama, Tennessee, Mississippi and Arkansas. He often consults with this network of physicians and they sometimes send their most difficult-to-treat patients to Duggan. “Being in a urology group of 30 physicians, requires some sub-specialization. I am fortunate to have had the opportunity to learn to perform the Greenlight PVP™ procedure and to be able to use my expertise to help patients,” he says.